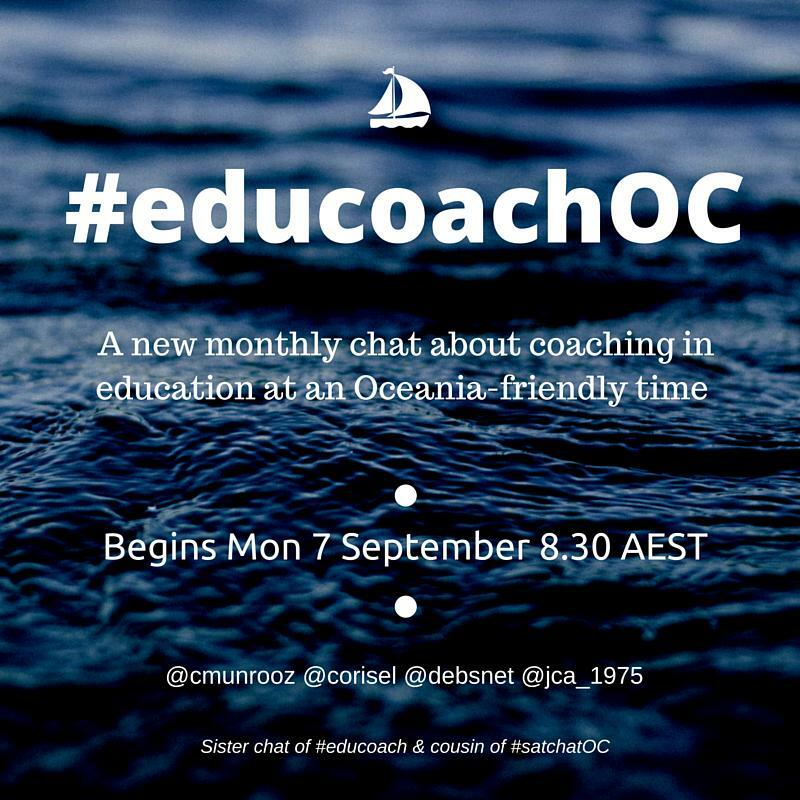 Welcome to the first ever #educoachOC Twitter chat, which will take place at 8.30pm AEST on Monday 7 September. With one week until the chat, here we outline the intent and approach of this new chat, as well as the questions we will be tweeting on the day. Our understanding of coaching is that, as distinct from mentoring or consulting, it is about helping the coachee work through their own thinking in order to reach a ‘next step’ most relevant to them. The coach is the almost-invisible vehicle which helps the coachee move from where they are, to their desired next point. Rather than advice-giving or the kind of direct instruction one might see in sports coaching, this kind of coaching is about building efficacy, agency and autonomy in the coached individual. We are looking forward to connecting with the online a coaching community. Although the time zone is friendly for Oceania-based people, all are welcome and we are excited to welcome our northern hemisphere friends, too. As you look at the questions, you’ll notice that we have used the GROWTH model to structure the chat. Additionally, the questions use elements of coaching questioning as outlined in Costa and Garmston’s Cognitive Coaching: exploratory language like ‘might’ and ‘some’, plural forms such as ‘strengths’ and ‘tools’, and positive presuppositions such as that people are reflective and have had successes. We are hoping to model good coaching practice through the flow and the crafting of the questions. Please find our first set of questions below. Q1 (introduction) – Please introduce yourself and your coaching context. Share a recent #coachingwin you’ve had, or tell us a bit about how you came to coaching. Q2a (Goals) – What is your coaching dream? Fast forward one year and tell us what would ideally be happening with coaching in your context. Q2b (Goals) – How do you know that this is where you need to be heading? Q3 (Reality) – Where are you in your coaching journey (from 1 – complete novice with basic interest, to 10 – experienced coach in embedded model)? Q4a (Options) – Tell us about some successful coaching tools or experiences to date, upon which you could build as you move forward. Q4b (Options) – What could you do now to move to the next point on your scale of coaching knowledge, expertise and practice? Q5 (Will) – What small steps will you take to move your ‘state of play’ closer to your coaching dream? What might be the first tiny signs of change? Q6 (Tactics) – What might be some strategies or resources you could draw on to get you to your next coaching step? How might the #educoachOC community and other human resources be able to help? Q7 (Habits) – What might you need to be most mindful of as you move forward from your current point in your coaching journey? How might you sustain your efforts? We hope you’ll join us on Twitter on Monday September 7th. LOVE your organization to #educoachOC!!! I’ll try my best to attend your first chat. Thank you Kathy. We really appreciate your inspiration and support.